I read Adiga’s Booker-prize winning The White Tiger and it was coruscating – an illumination of the seamy reality of the lives of the poor in India. 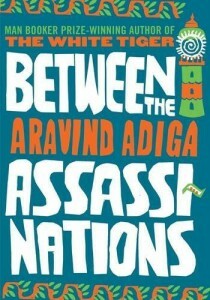 Between the Assassinations covers similar territory but very differently. Set in the period between the assassinations of Indira and Rajiv Ghandi, this collection of cod tourist facts and bitter life stories is just as revealing but lacks the central narrative thread that wove the characters of The White Tiger together. Some of the accounts of life in Kittur are absolutely devastating. Keshava is a village boy who arrives in Kittur with his brother after being told by his family to find an uncle he’s never seen and beg for work. He’s an innocent and a victim, whose hard work and constant willingness to see the best in others is rewarded with abuse, degradation and eventually an abandonment by the man for whom he has given his health and strength, the inaptly named ‘Brother’, who leaves him mentally incapable and eating rubbish from the streets. Others are simply sad. There is the tale of Murali, a communist who is the perfect acolyte, supporting an ineffectual leader and writing turgid short stories. With a touch of the cynicism echoing Graham Greene, Murali’s small but intensely focused life crumples around a single unanticipated fact – he falls in love with a young woman whom he cannot afford to wed, or so he decides. Unable to admit his love, he destroys the small life he has by watching the woman unsparingly, but never admitting to her that he adores her. One problem I had with this book is that it ends abruptly, in fact without warning, with a story that is one of the bleakest of the entire narrative. While a collection of short stories does not have to carry a narrative line, and while the many facets of Indian life that Adiga reveals are, in themselves, entirely rewarding and beautifully written, the central conceit of the guidebook leads the reader to expect that something is going to unite these accounts of the hidden life of India and nothing does. Apparently Between the Assassinations was written before The White Tiger and it shows … several of the themes in these short stories become amplified into the linear narrative of the later novel. The re-using of material reveals the depth and power of Adiga’s craft and his anger at the way that India has lurched politically in ways that bring nothing to the people who live in the streets and eat from the gutters.